You’ve seen it in your yard before I’m sure. 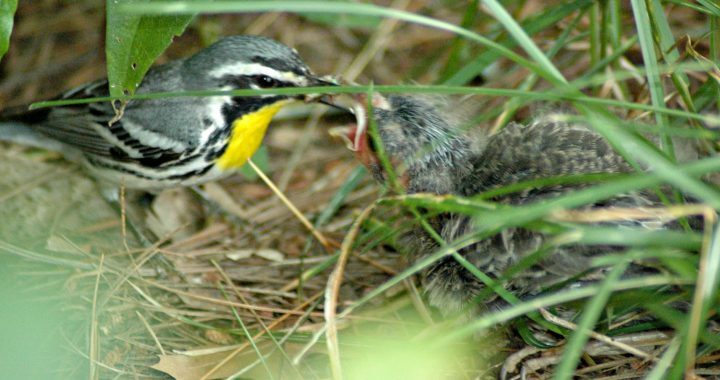 A little Carolina Wren feeding a big fat Cowbird baby. Or replace the wren with a Northern Cardinal or Eastern Bluebird. It could be up to two hundred and twenty different species of birds that may end up fostering this parasitic bird. That’s how it works with the Brown-headed Cowbird. Adult Cowbirds do not build a nest nor do they raise their young. The female doesn’t want to waste any energy so she lays her eggs in the nest of another bird species such as a Wren or Bluebird or Cardinal. This is why many people want to get rid of Cowbirds in their backyards. They hate seeing their beautiful songbirds raising these invasive birds that take over their feeders and bully the other birds. 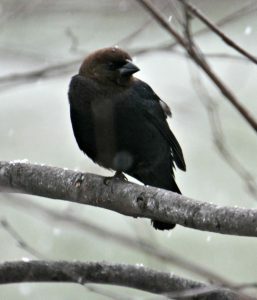 The male Brown-headed Cowbird has a black body with a dull brown head. The female is smaller and are a solid brown with a whitish throat and light streaking on their undersides. Cowbirds are considered one of the smaller blackbirds at 7.5 inches long. Compare that to the European Starling at 8.5 inches long and the Crow at 17.5 inches long. These Cowbirds are native to the northern continent found throughout the United States, Canada, and Mexico. You can find them in residential neighborhoods, pastures, fields, orchards, prairies, and near woodland edges feeding on seeds from grasses and weeds, grasshoppers, beetles, caterpillars, and spiders. They will also come to your bird feeders if you provide sunflower seed, cracked corn, or millet in them. Breeding season for these birds starts about mid to late April and goes until mid July. The female lays one egg per day for up to seven days. She may lay one egg in several different bird nests depending on how many there are. She takes a few days to rest then she starts this process all over again and will do this for several weeks. She may lay up to forty eggs in all. She finds nests to deposit her eggs by observing. When she spots a bird that has been building a nest she waits for it to leave then quickly goes in and lays an egg. Or if the nest already has eggs in it, she will either destroy one or two eggs or throw it out of the nest then lay one of hers in place of them. The female Cowbird can lay an egg in a matter of twenty seconds so she may never be seen by the host bird and the host bird may never notice that there is a different egg in its nest. 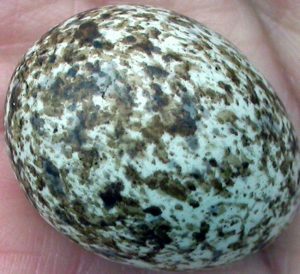 If the host bird does notice that the egg is different it may not be big enough (for example a wren or finch) to throw it out or destroy it so it incubates it with the other eggs. Bigger birds like the Blue Jay, Cedar Waxwing, and the Brown Thrasher will reject the eggs but sometimes the Cowbird will just come back and destroy the entire nest. It is one mean bird if you ask me. Here’s the kicker! If the Cowbird is successful in laying an egg in a nest and the host incubates it with its own the young Cowbird is the first to hatch. Cowbirds usually hatch about one day before the host eggs. Not only does it hatch first but it grows so much faster and bigger than the others and consequently becomes more demanding for food. 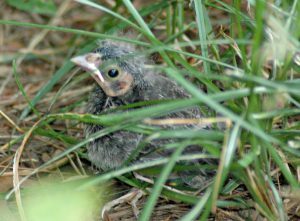 This could mean life or death for the other nestlings as the foster parents pay more attention to the young Cowbird’s demands. In addition, the big, fat Cowbird may smother the other smaller babies. The young Cowbirds fledge the nest at around 13 days and will be fed by their hosts until about 39 days. Then interesting enough once they are on their own they learn to recognize other Cowbirds by their sound and sight. They will begin to congregate with other Brown-headed Cowbirds before their first winter. Cowbirds also mix in with other blackbirds too such as Red-winged Blackbirds and Grackles. Note: Brown-headed Cowbird eggs are white to a grayish white with brown or gray spots or streaks in it. Other species’ eggs resemble the Cowbird’s so keep that in mind. You may have to wait until the eggs are hatched to know for sure. 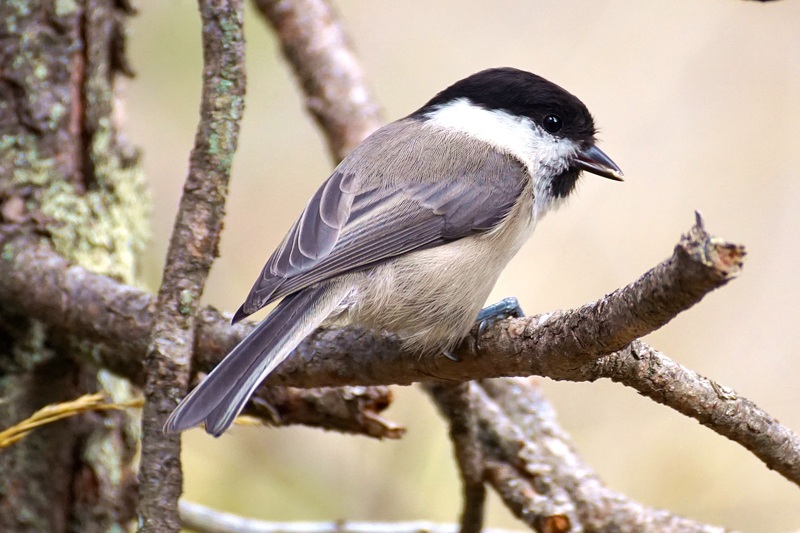 Use tube bird feeders that have a shorter perch and smaller ports for the seed. Feed the birds thistle/nyger, safflower seed, whole peanuts, or suet. Cowbirds will not eat this. Eliminate cracked corn, sunflower seeds, and millet from your feeders unless you have a smaller feeder that the Cowbirds are unable use. You really are not suppose to destroy Cowbird eggs according to the Migratory Bird Treaty Act unless you have a permit to do so. Do not search for bird nests in your yard when Cowbirds are around. Sounds kind of silly but if you are checking in on your Bluebird boxes for example, you may help a female Cowbird discover it too. Do not use platform feeders as Cowbirds can easily perch on them. Keep the ground clear from seed under feeders as Cowbirds can easily access it. You have to admit, Brown-headed Cowbirds are pretty smart birds. The fact that the female watches for other birds building nests so that she can sneak in, knock out one or two of their eggs and deposit one of hers in place of them is amazing. Plus, she may do this in several different nests before she is finished. Additionally, the fact that they can identify other Cowbirds by sight and sound when they are so young and instinctively flock together with them is fascinating. 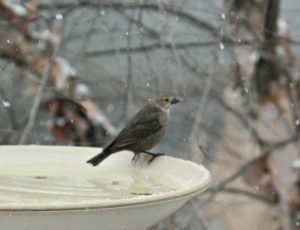 Getting rid of Cowbirds in your yard can be a little tricky but by eliminating the type of food that they like from your feeders such as cracked corn, sunflower seeds, and millet and providing feeders that they cannot get on may help. Plus, following the guidelines that I have mentioned earlier. You still may end up seeing a Cardinal raising a Cowbird or whatever bird it may be, but hopefully it won’t be as often. If you have any other ideas or solutions that have worked for you or if you would like to make a comment about this post, please feel free to do so below. Posted in Backyard Birds, Songbirds and tagged brown-headed cowbirds. So, you’re essentially telling people they can choose to ignore federal law? Kate, thanks for pointing that out to me. It definitely sounds like I am saying that after reading it again. No, I would never tell people to ignore federal law. What I meant to say was that people disagree with me about this permit as they think that since it is their yard they can do what they want. Quite frankly, it is hard to watch a wren or a warbler raising an ugly cowbird but it is just nature at work and you should leave it alone. Gail, the cowbird is seeing its reflection in your slider door thinking it is another cowbird invading its territory. While cowbirds do not build their own nests, as they lay them in other birds’ nests, they want to defend their particular territory so as not to have to compete for them. You may want to put some reflective tape, a sun catcher, or anything that will break up the reflection to keep it away. Bird poop all over your deck or patio is not enjoyable for sure! Keep me posted. Thanks for your comments! Thanks for posting this. I will definitely try your suggestions. We get flocks of cowbird emptying out our platform feeder every couple of days and have seen these birds bully the smaller birds! Do they ever migrate away from the mid-Atlantic region? We have a smaller adjustable feeder we can use when the cowbirds are around but like to see the greater variety of bird also. Thanks. Hi Sola, during breeding season in spring/summer they are more abundant at the feeders but this time of year they tend to be more distributed. I do not see them near as much thank goodness. Yes, I agree with you, a variety of birds at the feeder is much more enjoyable especially the little birds like the chickadees and titmice. Thanks for your post! Juvenile cowbirds are flocking to my feeders. they can get into tube feeder spring loaded for small birds because they are still immature (sparrow sized.). tried switching to nyjer and safflower. they are still partying down. they have scared away all buy one big red bird (bigger than cardinal) and little black capped chickadees that come whenever the cowbirds leave. The cowbirds seem to stand guard on feeders even when they are not eating. I have have groups of ten or more around one feeder with safflower and nyjer only in it. They also sit in groups on the bath. any thoughts? Get to like cowbirds? Hi Brian, are you sure that they are not House Finches? Juvenile cowbirds look like female house finches. The reason why I am asking is because they are feeding on the nyger. I have never seen cowbirds on my nyger feeders before (doesn’t mean they won’t) but they usually do not eat that. Their behavior really sounds like finches to me. Also, I am curious where you live. Here in Kentucky the cowbirds and the other blackbirds (red-winged, grackles) have left and are gathering in large flocks right now. I do not have any blackbirds hanging around at all and enjoying my other birds at the feeders. If you are sure that they are juvenile cowbirds then I would take the feeders down for a week or two. They should move on. So glad to see your website. I have been watching birds outside our kitchen deck for only a few years. We live in upstate SC at the NC border (Polk County). I started making note of the birds I would see outside in my “Golden Book” A Guide to Field Identification BIRDS of North America. What fun to ID birds I would see, and make note of the date I would see them for my first time! The first I saw a Cowbird at my feeders was 5-1-13. Now, this year they are showing up at the end of February!!! Earlier and earlier every year. At the end of you info. website, I see several bird feeders that could deter Cowbirds. I hope these feeders are your recommendation. Can you please expound on the best tube feeders to get, and also what to put in them so the Cowbirds are unhappy and my “regular” wonderful birds are happy!?? Ann, yes the tube feeders on my post should be good to deter cowbirds especially if you use safflower seed and thistle/nyger. Whole peanuts are also good too. The thistle/nyger seed will attract goldfinches especially but chickadees and cardinals will come in to it as well. Do not include any corn, sunflower seed, or millet in your feeders because cowbirds love that unless you have a feeder with a shorter perch. Cowbirds have a more difficult time on smaller perches with smaller ports where they get the seed from. Good luck and let me know how it all goes for you. Thanks for your comments! Day before yesterday my feeder was covered in goldenfinches and even had a few cardinals and a beautiful blue bird that I have never seen before (we live in south Arkansas). By the next day the cowbirds had run everything else off, emptied the feeder, and basically taken over. I am going to try the tube feeder you recommend and see if that helps. Kay, yeah the cowbirds are such a pesky bird. I hate when they come in and take over the feeders and scare all the pretty birds away. We have a platform feeder which I like for the hawks and other bigger birds that the cowbirds like to come in to but I will deal with them as we have other feeders set out for the smaller birds. Hopefully the tube feeder will work for you. Sometimes having two feeders helps because the smaller birds have another place to go. Let me know how it works for you and keep me posted. Thanks for your comments!